The Evolution of Spawn infographic is a fantastic design. Not fan art, this official infographic was designed by Todd McFarlane, Creator of Spawn and Co-Founder and President of Image Comics! With Spawn issue #250 coming up at the end of the month…. 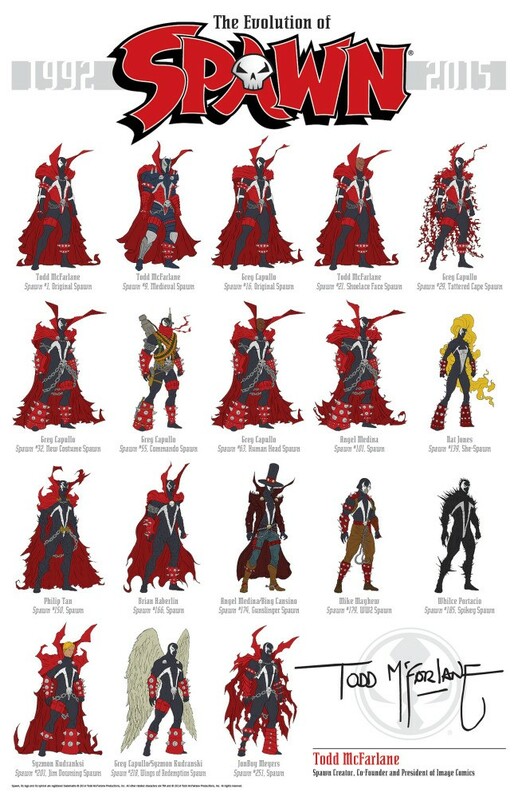 I thought it would be COOL to put together all the different costumes Spawn has had over the years. And if you’re doing the math, that’s 24 YEARS. TWENTY-FOUR!!!!!!!! It’s cool to look back and see how things have changed since 1992….it’s hard to believe we’re already coming up on our #250th issue. Thanks for all your support over the years!!! I’ll be doing a giveaway with these, soon.